What a sea change there has been in public opinion in the last ten years or so which has made the recording of the music here not only possible but desirable. Two of the works had not been heard between their first performances (Three Dances, 1915; Piano Concerto, 1925) and 1989 when the present writer put together a Howells ‘Composer of the Week’ series on Radio 3, concentrating for the first time on the orchestral music. It was a revelation. What is the reason for the neglect over so many years of almost all of Howells’s orchestral music? The answer, perhaps, is twofold. First, Howells was notoriously sensitive to criticism. An adverse word from any source would trigger the immediate withdrawal of a work from circulation. Why this was so is difficult to say. Probably the answer lies in his being put on a pedestal by Stanford where he was led to believe that everything he did was good. When subsequently he was prey to the whims and prejudices of the lions’ den of the critical press he did not have the inner self-confidence and strength to cope with their claws. Secondly, where he once said ‘there’s no room for symphonic lengths these days’ (feeling, perhaps, that the concert-going public’s attention span was not capable of taking a major new symphonic work), in reality it was not his way and that this was just what the public did want. Of the three works recorded here, two – the Piano Concerto and the Concerto for string orchestra – are major three-movement works. The Three Dances, on the other hand, are delightful miniatures, written in 1915 in relatively carefree student days (relatively, because the Great War was already a year old though Howells, through ill health which nearly killed him in 1917, was exempted from active service). They were composed for a young fellow-student George Whittaker, a highly gifted violinist who had entered the College aged only eleven. Certainly the music has no hint of the momentous events beginning to take shape and which would fundamentally affect one of his closest friends, Ivor Gurney, and kill a number of others. The dances are, in fact, extremely sunny pieces, not yet imbued with the Howellsian pathos which grew to dominate his mode of speech. To this end they are as yet uncharacteristic, speaking more of his teacher’s influence than of his own intuitive nature which was still to come to its maturity. Putting that aside, however, what lovely pieces they are. The first (Giocoso molto), quite big-scale, is almost a gypsy dance with some brilliantly colourful orchestration laid out for large forces. In the manuscript Howells writes at the end that he finished the score in bed; it is nice to know that student habits don’t change over the years. The second dance (Quasi lento, quieto) has one of the most beguiling tunes of the period. To some extent it is the change in his later music away from writing a tune to creating long-breathed, melismatic phrases, which creates the aural problem for the unsophisticated listener who wants the ‘anchorage’ which a regular-metre melody gives. Here, though, there is no problem. Why this dance alone did not become a classic ‘pop’ of the period is difficult to understand, though it is probably bound up with Howells’s reticence and his impatience, as a student, to be getting on with the next project. The last dance (Molto allegro) is, by contrast, short and furious, providing an exquisite foil to the others. Here is Howells, already, aged only twenty-three, a consummately skilled orchestrator, a highly gifted creator of atmosphere (one of the most important features of his mature style) and having a considerable skill with both form and melody. Ten years on from the composition of these dances Howells was a familiar name. He had been thrust into the limelight in 1916 with the publication of his Piano Quartet in A minor under the auspices of the Carnegie Trust. Amongst the seven composers chosen to have works published, Howells’s was the only unknown name, and his was the only piece of chamber music; his was also the first to be published. In these early years it appeared that nothing could stop Howells’s meteoric rise to stardom. Music flowed from him in an unstoppable flood of inspiration; orchestral works, a remarkable series of chamber works including three string quartets and a clarinet quintet, music for piano, for organ, three violin sonatas, solo songs including King David – one of the classics of the period – and works for chorus and orchestra including at the behest of Elgar a 1922 Gloucester Three Choirs Festival commission, Sine nomine. Then came a commission from the Royal Philharmonic Society for a performance in the Queen’s Hall, London in 1925, the Piano Concerto No 2 in C minor. Sargent was to conduct (his debut with the Society) and Harold Samuel (famous for his Bach recitals) was to be soloist. The first signs of a problem arose when Samuel received the score and found that he heartily disliked the work. The composer Howard Ferguson, who was a pupil of Samuel’s and lived in his house at the time, remembers helping Samuel to learn the work by being the ‘orchestra’ on a second piano. He recalls that Samuel tried to get the Society to release him from the engagement; they refused, and the performance went ahead as planned. The reception of this work caused Howells to freeze as a composer. Although the concerto was at proof-stage with the publishers he instantly withdrew it and virtually stopped composing for some ten years, writing in the interim only very small-scale pieces and revising some early compositions. All this was, of course, a huge overreaction to a histrionic display which, in any country other than England, would have been regarded as par for the course and merely amusing. To the oversensitive Howells, though, it was a nightmare. Late in the composer’s life the pianist Hilary Macnamara persuaded him to have another look at it. He began revising the work but soon put it aside again. The concerto is a big-scale, three-movement work, designed on a very unusual ground plan (which was possibly what led to the outburst). Howells organized the three movements as a huge sonata-form structure with the first movement acting as the exposition, the slow movement as the development, and the last movement as a modified recapitulation (all the movements are linked). To this extent the constant referral back to the first subject (a short, diatonic tune) can become monotonous unless sympathetically interpreted. The problems at the first performance were exacerbated by unsympathetic performers. This must have come across to any with ears to hear. Howells’s Piano Concerto No 2 is full of drama and lyricism. He intended it to be a ‘diatonic affair, with deliberate tunes all the way … jolly in feeling, and attempting to get to the point as quickly as maybe’. Certainly it is a tour de force and is quite unlike any other concerto of the period. With its brilliant use of the orchestra and its colourful effects it must have sounded very modern indeed to that audience on 27 April 1925. In 1935 Howells’s only son died of polio, aged only nine. It was another and far more devastating moment in his life. Emotionally paralysed for some time, he began to pick up composition again as a means of purging the ghost of his son. Before the boy’s death Howells had been composing a work for string orchestra to commemorate the recent death of Elgar. In 1938 he completed it, giving it the title Concerto for string orchestra. Not all of it was new: the first movement was an extensive reworking of the ebullient Preludio from an early string orchestra suite of 1917, the second movement of which became a separate work – the Elegy for viola, string quartet and strings, one of the composer’s most beautiful orchestral works. The second movement jointly commemorates Elgar and Michael Howells. Howells called it ‘submissive and memorial in its intention and purpose’. The third movement balances the first in its energy and drive. The death of Howells’s son ironically unlocked the frozen powers which had stopped him composing after the debacle of the second piano concerto. He went on to write his undisputed masterpiece, Hymnus Paradisi, and the whole emphasis of his work shifted from music for the concert hall to music either for the church, or choral music with non-liturgical religious texts such as the Stabat mater written in the mid fifties. This (the church music) is the music by which he is best known. 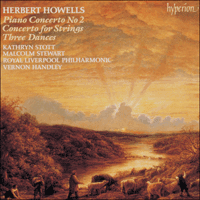 Recordings such as this serve to redress the imbalance which has existed for years in the appreciation of Howells’s output by giving us the opportunity to reassess these major orchestral scores through which Howells’s career developed and his musical personality reached maturity. Quel changement radical a dû affecter l’opinion publique ces dix dernières années pour avoir rendu le présent enregistrement possible, et même souhaitable. Deux des œuvres proposées, qui n’avaient pas été jouées depuis leur création (Three Dances, 1915; Piano Concerto, 1925), ne sortirent de l’oubli qu’en 1989, date à laquelle l’auteur de ces lignes prépara une émission consacrée à Howells, dans le cadre de la série «Composer of the Week» sur Radio 3, en se focalisant pour la première fois sur la musique orchestrale. Ce fut une révélation. Deux des trois pièces enregistrées ici (le Piano Concerto et le Concerto for string orchestra) sont de grandes œuvres en trois mouvements aux antipodes des Three Dances, délicieuses miniatures écrites en 1915, en un temps estudiantin relativement insouciant (relativement, car la Grande Guerre durait depuis un an déjà, même si Howells fut exempté de service actif, victime d’ennuis de santé qui manquèrent d’ailleurs le tuer en 1917). Elles furent composées pour un jeune condisciple, George Whittaker, violoniste surdoué, entré au College dès ses onze ans. Cette musique ne fait en rien allusion aux événements cruciaux qui se dessinaient déjà et qui devaient affecter radicalement un des plus proches amis de Howells, Ivor Gurney, mais aussi en tuer plusieurs autres. Les danses sont, en réalité, des pièces extrêmement ensoleillées, pas encore imprégnées du pathos qui finit par dominer le mode d’expression howellsien – de ce point de vue, elles ne sont pas encore caractéristiques, disant plus l’influence de son professeur que sa propre nature intuitive, encore immature. Mais, ceci mis à part, quelles pièces charmantes! La première (Giocoso molto, piste), résolument à grande échelle, est presque une danse gitane, à l’orchestration colorée, conçue pour des forces imposantes. À la fin du manuscrit, Howells précise qu’il acheva cette partition au lit – il est agréable de savoir que les mœurs estudiantines résistent à l’usure du temps. La deuxième danse (Quasi lento, quieto) recèle l’un des airs les plus séduisants de cette époque, marquant d’une certaine manière le changement qui surviendra plus tard chez Howells, quand il passera de l’écriture d’une mélodie à la création de longues phrases mélismatiques – d’où le problème rencontré, à l’audition, par un public peu sophistiqué, qui cherche l’«ancrage» procuré par une mélodie au mètre régulier. Aucun problème, ici, cependant. Difficile de comprendre pourquoi cette danse, prise seule, n’est pas devenue un standard de cette époque, même si cela tient probablement à la réticence de Howells, à son impatience estudiantine qui le poussait vers le projet suivant. La dernière danse (Molto allegro) est, par contraste, brève et furieuse, faisant un exquis repoussoir aux deux autres. Elle nous montre un Howells qui est déjà, à seulement vingt-trois ans, un orchestrateur consommé, créateur d’atmosphère fort talentueux (l’une des grandes caractéristiques de son style abouti) et remarquable maître de la forme comme de la mélodie. Dix ans après ces Three Dances, Howells s’était fait un nom. En 1916, la publication, sous les auspices du Carnegie Trust, de son Quatuor avec piano en la mineur le fit passer sur le devant de la scène – sur les sept compositeurs choisis pour voir leurs œuvres publiées, il était le seul inconnu, le seul, également, dont la musique était une œuvre de chambre. Dans ces premières années, rien ne sembla pouvoir stopper l’ascension fulgurante de Howells vers la célébrité. La musique lui venait en un flot inarrêtable: des pages orchestrales, une remarquable série d’œuvres de chambre incluant trois quatuors à cordes et un quintette avec clarinette, de la musique pour piano, pour orgue, trois sonates pour violon, des mélodies solo (dont King David, l’un des grands classiques de l’époque) et des pièces pour chœur et orchestre, tell Sine nomine, qu’Elgar commanda pour le Gloucester Three Choirs Festival de 1922. S’ensuivit une commande de la Royal Philharmonic Society en vue d’un concert au Queen’s Hall de Londres, en 1925: le Concerto pour piano no2 en ut mineur. Initialement, il devait être dirigé par Sargent (qui faisait ses débuts avec la Society), avec en soliste Harold Samuel, célèbre pour ses récitals Bach. Mais les prémices d’un problème se firent jour lorsque Samuel, recevant la partition, découvrit qu’il en détestait cordialement le contenu. Le compositeur Howard Ferguson, élève de Samuel, se rappelle avoir aidé ce dernier – chez qui il vivait alors – à apprendre ce concerto en faisant l’«orchestre» sur un second piano. Il se souvient aussi que Samuel tenta de convaincre la Society de le libérer de son engagement. En vain: le concert se déroula comme prévu. Cet accueil glaça les élans de Howells, qui retira le concerto sur-le-champ (pourtant déjà aux épreuves chez les éditeurs) et cessa pratiquement de composer pendant dix ans, se contentant d’écrire des pièces à très petite échelle et de réviser quelques œuvres anciennes. Ce fut, bien sûr, une réaction incroyablement disproportionnée par rapport à ce qui n’était qu’une exhibition histrionique – laquelle eût été considérée, dans tout autre pays que l’Angleterre, comme normale et juste amusante. Mais pour l’hypersensible Howells, ce fut un cauchemar. Vers la fin de sa vie, il se laissa fléchir par la pianiste Hilary Macnamara et accepta de rejeter un œil à ce concerto, dont il entama même la révision, avant de bien vite le délaisser. Le concerto est une œuvre à grande échelle en trois mouvements conçue selon un plan fort insolite (qui fut peut-être à l’origine des déchaînements), puisque Howells l’agença en une immense structure de forme sonate, où le premier mouvement, le mouvement lent et le dernier mouvement font respectivement office d’exposition, de développement et de réexposition modifiée (tous les mouvements étant liés). À cet égard, le renvoi constant au premier sujet (un court air diatonique) peut s’avérer monotone s’il n’est pas interprété avec bienveillance. Les problèmes survenus lors de la création furent exacerbés par des exécutants peu compréhensifs. Tous ceux qui avaient des oreilles pour entendre l’auront remarqué. Ce Piano Concerto no2, plein de drame et de lyrisme, Howells le conçut comme «une chose diatonique, avec des airs délibérés tout du long … d’humeur plaisante et s’efforçant d’aller au but aussi vite que possible». C’est assurément un tour de force, qui ne ressemble en rien aux autres concertos contemporains. Avec son usage brillant de l’orchestre et ses effets colorés, il a dû paraître bien moderne à l’auditoire du 27 avril 1925. En 1935, le fils unique de Howells mourut de la polio, à seulement neuf ans. Ce fut un nouvel épisode dévastateur dans la vie du compositeur, bien plus dévastateur. D’abord émotionnellement paralysé, il se remit à composer, moyen pour lui de chasser le fantôme de son fils. Avant la mort du garçonnet, il avait entrepris d’écrire une œuvre pour orchestre à cordes destinée à commémorer la mort récente d’Elgar. En 1938, il l’acheva et l’intitula Concerto for string orchestra. Tout n’y était pas nouveau: le premier mouvement était ainsi une vaste réécriture du bouillant Preludio d’une suite pour orchestre à cordes (1917), dont le deuxième mouvement devint même une œuvre à part entière – l’Elegy pour alto, quatuor à cordes et cordes, l’une de ses plus belles pages orchestrales. Howells qualifia le deuxième mouvement, qui commémore à la fois Elgar et Michael Howells, de «docile et commémoratif dans son intention comme dans son propos». Le troisième mouvement contrebalance le premier par son énergie et par son allant. Ironiquement, la mort de son fils dégela ce qui l’avait fait cesser de composer après la débâcle du deuxième concerto pour piano. Il s’attela alors à son chef-d’œuvre incontesté, Hymnus Paradisi, et toute l’emphase de son travail passa de la salle de concerts à l’église – ou encore à de la musique chorale sur des textes religieux non liturgiques, comme le Stabat mater (milieu des années 1950). C’est avant tout pour cette musique religieuse qu’il est connu. Des enregistrements comme celui-ci sont là pour combler le déséquilibre qui a longtemps affecté l’appréciation de l’œuvre de Howells en nous permettant de réévaluer les grandes partitions orchestrales sans lesquelles ce compositeur n’aurait jamais atteint sa maturité musicale. Welch eine erstaunliche Wandlung hat die öffentliche Meinung in den letzten zehn Jahren durchgemacht, um die Einspielung der vorliegenden Musik nicht nur möglich, sondern sogar wünschenswert zu machen. Zwei der Werke waren zwischen ihrer jeweiligen Uraufführung (Three Dances 1915; Klavierkonzert 1925) und 1989 nicht zu hören – in jenem Jahr stellte der Autor dieser Zeilen eine Howells-Serie im Rahmen der Programmfolge „Komponist der Woche“ für den BBC-Sender Radio 3 zusammen, die sich erstmals auf die Orchestermusik des Komponisten konzentrierte. Sie war eine Offenbarung. Woran liegt es also, dass Howells’ Orchestermusik größtenteils so viele Jahre lang vernachlässigt worden ist? Darauf gibt es wohl zweierlei Antworten. Zum einen reagierte Howells ausgesprochen empfindlich auf Kritik. Ein negatives Wort, aus welcher Quelle auch immer, konnte dazu führen, dass das betreffende Werk sofort aus der Öffentlichkeit zurückgezogen wurde. Warum das so war, ist schwer zu beurteilen. Wahrscheinlich ist die Antwort in seiner Vergötterung durch Stanford zu suchen, die ihn glauben ließ, alles, was er in Angriff nahm, müsse gut sein. Wenn er in der Folge den Launen und Vorurteilen aus der Löwengrube der Pressekritik ausgeliefert war, besaß er nicht die innere Stärke und Selbstgewissheit, um sich deren Klauen entziehen zu können. Zum andern mag er zwar einmal behauptet haben, es sei „heutzutage kein Platz für sinfonische Längen“ (möglicherweise im Glauben, dass die Aufmerksamkeitsspanne des Konzertpublikums nicht ausreiche, um ein größeres neues sinfonisches Werk zu rezipieren), doch war er in Wirklichkeit davon nicht überzeugt, und genau das war es ja, was das Publikum wollte. Von den drei hier eingespielten Werken sind zwei – das Klavierkonzert und das Konzert für Streichorchester – groß angelegte dreisätzige Werke. Im Gegensatz dazu sind die Drei Tänze ergötzliche Miniaturen, die 1915 während seiner relativ sorgenfreien Studententage entstanden (relativ deshalb, weil der Erste Weltkrieg damals schon ein Jahr wütete, obwohl Howells wegen seiner angegriffenen Gesundheit, die ihm 1917 beinahe den Tod brachte, vom Kriegsdienst freigestellt war). Die Stücke waren dem jungen Kommilitonen George Whittaker zugedacht – er war ein hochbegabter Geiger, der im Alter von nur elf Jahren ans College aufgenommen worden war. Jedenfalls enthält die Musik keinerlei Hinweise auf die sich damals abzeichnenden folgenschweren Ereignisse, die Ivor Gurney, einen von Howells engsten Freunden, nachhaltig beeinflussen sowie eine Reihe weiterer Bekannter in den Tod führen sollten. Im Gegenteil: Die Tänze sind ausgesprochen heiter angelegt und enthalten noch nichts von dem Howells’schen Pathos, das seine Ausdrucksweise mit der Zeit beherrschen würde. Insofern sind sie noch uncharakteristisch und künden eher vom Einfluss seines Lehrers als von seinem eigenen intuitiven Wesen, das erst später heranreifte. Doch handelt es sich nichtsdestoweniger um wunderbare Stücke. Das erste, recht weitläufig angelegte (Giocoso molto), könnte mit seiner teils glänzend farbenfrohen Orchestrierung für erhebliche Kräfte fast ein Zigeunertanz sein. Ans Ende des Manuskripts schreibt Howells, er habe die Partitur im Bett fertiggestellt; wie beruhigend, feststellen zu können, dass sich studentische Gewohnheiten im Lauf der Jahre kaum geändert haben. Der zweite Tanz (Quasi lento, quieto) verfügt über eine der bezauberndsten Melodien der Epoche. In gewissem Maße ist es der Wechsel in seinem späteren Schaffen vom Darlegen einer Melodie hin zum Erfinden langatmiger, melismatischer Phrasen, der problematisch ist für den weniger anspruchsvollen Hörer, der sich nach dem „Anker“ einer Melodie in beständigem Metrum sehnt. In diesem Fall gibt es damit jedoch kein Problem. Warum dieser Tanz nicht zum klassischen „Hit“ der Epoche wurde, ist schwer zu verstehen, obwohl es wahrscheinlich mit Howells’ bescheidener Art zu tun hat, und mit seiner Ungeduld als Student, das jeweils nächste Projekt in Angriff zu nehmen. Der letzte Tanz (Molto allegro) ist kurz und heftig, so dass er zu den anderen einen wunderbaren Widerpart abgibt. Hier tritt Howells im Alter von nur dreiundzwanzig Jahren bereits als vollendeter Orchestrierer hervor, als hochbegabter Beschwörer von Atmosphäre (eines der wichtigsten Merkmale seines reifen Stils), mit beachtlichen Fähigkeiten in Bezug auf Form und Melodik. Zehn Jahre nach der Entstehung dieser Tänze war Howells ein bekannter Mann. Er war 1916 mit der Veröffentlichung seines Klavierquartetts in a-Moll unter der Schirmherrschaft des Carnegie Trust ins Rampenlicht der Öffentlichkeit getreten. Unter den sieben Komponisten, die zur Publikation ihrer Werke ausgewählt wurden, war Howells der einzige unbekannte, und seines war das einzige Kammermusikwerk. In diesen frühen Jahren schien es, als wäre Howells kometenhafter Aufstieg zur Berühmtheit geradezu vorbestimmt. Ihm entströmte Musik in einer unaufhaltsamen Flut der Inspiration: Orchesterwerke, eine bemerkenswerte Reihe von Kammerwerken, darunter drei Streichquartette und ein Klarinettenquintett, dazu Klavier- und Orgelmusik, drei Violinsonaten, Sololieder, darunter King David (ein Klassiker der Epoche), sowie Kompositionen für Chor und Orchester, einschließlich Sine nomine, entstanden im Auftrag von Elgar für das 1922 in Gloucester abgehaltene Three Choirs Festival. Es folgte eine Auftragsarbeit für die Royal Philharmonic Society zur Aufführung 1925 in der Londoner Queen’s Hall, das Klavierkonzert Nr. 2 in c-Moll. Malcolm Sargent war (in seinem Debüt für die Philharmonic Society) als Dirigent vorgesehen, und der für seine Bach-Recitals berühmte Harold Samuel als Solist. Die ersten Schwierigkeiten zeichneten sich ab, als Samuel die Partitur erhielt und feststellte, dass ihm das Werk von Herzen zuwider war. Der Komponist Howard Ferguson, ein Schüler Samuels, der damals unter dessen Dach wohnte, erinnert sich, wie er Samuels beim Einstudieren des Werks half, indem er auf einem zweiten Klavier die Orchesterparts spielte. Wie er sich entsinnt, versuchte Samuels die Society dazu zu bringen, ihn aus seiner Verpflichtung zu entlassen; Man weigerte sich, und die Aufführung fand statt wie geplant. Die Reaktion dieses Werk veranlasste Howells dazu, als Komponist zu erstarren. Obwohl das Konzert beim Verlag bereits die Korrekturphase durchlief, zog er es sofort zurück und hörte zehn Jahre lang fast völlig zu komponieren auf – während dieser Zeit schrieb er lediglich sehr bescheiden angelegte Stücke und bearbeitete einige frühere Werke. All das war natürlich eine groteske Überreaktion auf einen theatralischen Ausbruch, der in jedem anderen Land außer England als wenig beachtenswert und lediglich amüsant angesehen worden wäre. Auf den übersensiblen Howells wirkte die Angelegenheit jedoch wie ein Alptraum. Der Pianist Hilary Macnamara überredete den Komponisten gegen Ende seines Lebens, sich das Werk noch einmal vorzunehmen. Er begann mit der Überarbeitung, legte es jedoch bald wieder beiseite. Das Konzert ist ein großangelegtes dreisätziges Werk mit einem ausgesprochen ungewöhnlichen Gesamtplan (was womöglich zu dem erwähnten Ausbruch beitrug). Howells organisierte die drei Sätze als übergreifende Sonatensatzform, wobei der erste Satz als Exposition, der langsame Satz als Durchführung und der letzte Satz als modifizierte Reprise diente (die Sätze sind sämtlich miteinander verbunden). Insofern kann die ständige Rückführung auf das erste Thema (eine kurze diatonische Melodie) mit der Zeit monoton wirken, wenn das Werk nicht einfühlsam interpretiert wird. Die Schwierigkeiten der Uraufführung wurden noch durch wenig einfühlsame Interpreten verschlimmert. Das muss allen, die Ohren hatten zu hören, bald klar geworden sein. Howells’ Klavierkonzert Nr. 2 ist erfüllt von Dramatik und Lyrismus. Er sah es als „diatonisches Gebilde, durchzogen von bewusst gesetzten Melodien … vom Gesamtgefühl her fröhlich und darum bemüht, so rasch wie möglich auf den Punkt zu kommen.“ In jedem Fall ist es eine Glanzleistung und unterscheidet sich grundsätzlich von allen anderen Instrumentalkonzerten jener Zeit. Mit seinem brillanten Einsatz des Orchesters und der bunten Palette von Effekten muss es jenem Publikum am 27. April 1925 ausgesprochen modern vorgekommen sein. Im Jahre 1935 starb Howells’ einziger Sohn mit nur neun Jahren an Kinderlähmung. Es war wiederum ein bestimmender und weit verheerenderer Moment in seinem Leben. Einige Zeit lang wirkte er emotional wie gelähmt und begann sich wieder mit Komposition zu beschäftigen, um das Gespenst seines Sohnes zu bannen. Vor dem Tod des Jungen war Howells damit beschäftigt gewesen, ein Werk für Streichorchester zum Gedenken an den kurz zuvor verstorbenen Elgar zu schreiben. Er stellte es 1938 fertig und gab ihm den Titel Konzert für Streichorchester. Nicht alles darin war neu: Der Kopfsatz war eine weitreichende Umarbeitung des überschwenglichen Preludio aus einer frühen Suite für Streichorchester von 1917, aus deren zweitem Satz ein eigenständiges Werk wurde – die Elegie für Bratsche, Streichquartett und Streicher, eines der schönsten Orchesterwerke des Komponisten. Der zweite Satz ist sowohl dem Andenken Elgars wie dem von Michael Howells gewidmet. Howells beschrieb es als „von der Intention und vom Ziel her unterwürfig und gedenkend“. Der dritte Satz bildet mit seiner Energie und seinem Schwung ein Gegengewicht zum ersten. Der Tod von Howells’ Sohn setzte ironischerweise die Kräfte frei, deren Erstarrung ihn nach dem Debakel des Zweiten Klavierkonzerts am Komponieren gehindert hatte. In der Folge schrieb er sein unangefochtenes Meisterwerk Hymnus Paradisi, und der ganze Schwerpunkt seines Schaffens verschob sich von Musik für den Konzertsaal hin zu Kirchenmusik bzw. zu Chormusik mit außerliturgischen religiösen Texten, wie z.B. das um die Mitte der 1950er-Jahre entstandene Stabat mater. Dafür (d.h. für die Kirchenmusik) ist er heutzutage besonders bekannt. Einspielungen wie die vorliegende können dazu dienen, das seit Jahren im Bezug auf die Würdigung des Howells’schen Œuvres herrschende Ungleichgewicht zurechtzurücken, indem sie uns Gelegenheit geben, diese bedeutenden Orchesterpartituren, mittels derer sich Howells’ Karriere entwickelte und seine musikalische Persönlichkeit heranreifte, neu zu bewerten.